It's what many of us cut our photographic teeth on. Nowadays it's all iPhone 10 and Instagram, but not so very long ago film developing was the moment when you realised if the shot was good or great. Unadulterated images brought to you on film. What happens in camera, stays in camera. No digital manipulation, just the honest truth of a good (or bad) photograph. What is it about film that makes photographers young and old so passionate. Is it the relationship we have from loading the film to that last frame that seems so…… final? Although film celluloid is mass produced, what we do with it is rather unique. Individual in fact. No two films are alike, making every frame a precious masterpiece. A moment in time suspended in light sensitive emulsion. What we do with our film is an important decision. After shooting the final frame, should we chose film developing based on price? Or should we consider where we send our film as carefully as we consider the shots we take on it? CC Imaging proudly held the contract with Fujifilm for the latter years of their official UK processing laboratory. Fujifilm entrusted us with their film developing, which has to be a glowing recommendation. We are one of the UK’s premier labs for slide film processing, backed by our Fujifilm heritage. Our goal is to love your film as much as you do and ensure it receives the very best film developing. For postal costs, please see this guide. Chemicals, alchemy and film developing. Few know the history of the chemical process. Fewer still have dipped their hand into the vast array of changing chemistry over the years. New films led to new chemical processes, some of which felt like dirty jobs (not all we’re happy to say – ed). Through it all, three film developing processes have stood the test of time. This is the mainstay of film developing. Almost all negative films are now processed through C41 chemistry. We have the facility to push (rate a film at a higher iso) film, but unfortunately we can’t pull (rate a film at a lower iso) negative film. 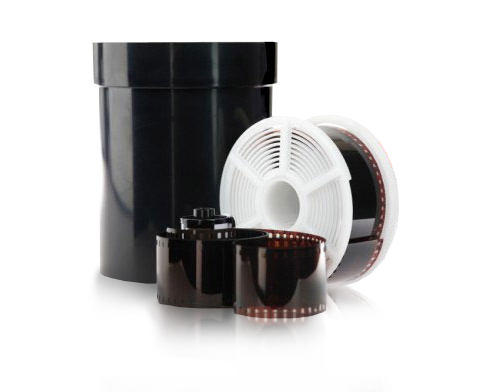 Films can be left ‘on the roll’ or cut and sleeved at no extra cost. This chemistry is used to process slide/transparency films. It is a temperature critical process, making it a rather unpleasant job during summer months. We use a ‘dip & dunk’ machine that suspends films in a series of chemical baths. Other companies use machines which pass film through rollers, not us. We’re not keen on introducing scratches. 35mm slide mounting for just an additional £2.99. Ahh, the old fashioned contemporary stuff. Black & white film developing is done in-house and by hand. Chemistry dilutions are mixed for each film processed, according the the manufacturers guidelines. 35mm, 120, 220, 5×4 & 10×8 sizes can be processed. Fresh chemistry mixed just for your film. With much regret, we cannot process Kodachrome film. In fact, we’re not entirely sure who still provides Kodachrome film developing. Buy multiple vouchers for discounted processing. We now offer a handy way to purchase E6 processing vouchers in quantities of 10, 25 & 50. You can make a purchase on our Analogue Shop via PayPal. When you have added the services/products you require to your basket, you will be asked how you would like to pay for your order when checking out. I have a voucher, now what? You will need one voucher for each of your films, please note that this voucher is only valid for E6 process films (not Kodachrome). Complete the voucher by filling in your details as shown in the example below. Need prints or scans? Choose a package deal now!